In this Rio Review, take a look back at the games with Hugo Calderano as he reflects on his experience playing in front of a home crowd one year on. This time one year ago Hugo Calderano was making his mark on the Rio Olympic Games; so much so that #HugoCalderano and #GoHugo were trending on Twitter. “It was an amazing experience to play in front of a big and supportive crowd like that,” says Calderano. He had won over the fans and they backed him all the way. The boy from Brazil had upstaged the visitors, making sure they knew they were on his turf. He had defeated both Pär Gerell and Tang Peng in succession during the games. Two years earlier Calderano had won bronze at the Nanjing 2014 Youth Olympic Games. In front of a home crowd he graduated to the senior ranks. The experience of Rio has been lasting for Calderano. A year on and he is still on the rise. The Brazilian didn’t let the opportunity slip and has taken full advantage of the momentum he received during his Olympic campaign. But it’s not just on the table that his life has been impacted. Brazil still loves Calderano. But the purpose of the Olympic Games isn’t just about putting on a spectacular show. It also enables sports to grow, giving them increased exposure and allowing them to develop. The young star is hoping the Olympic Games was the springboard table tennis needed to give the sport a boost. 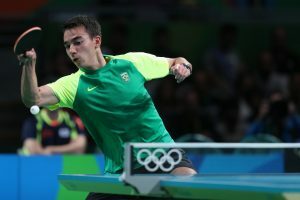 Calderano served as the perfect spokesman for the sport in Rio, and continues to lead the way for Brazilian table tennis one year on. At the Rio Olympics, Hugo Calderano made a nation fall in love with table tennis.